Holiday Colors come together in a beautiful woven pattern to bring Merry to the party. The final touch is a matching green hand tied bow. Add a special touch to gift items purchased from Paper Concierge! Gift wrapping is now available for items purchased from Paper Concierge. For only $12.99 you can wrap any item in one of 8 beautiful designs. **Please note that Gift Wrapped packages require Priority shipping. Pricing includes the upgrade due to the additional weight. No coupon or special offers apply to Gift Wrapping. 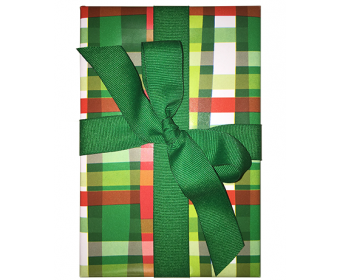 Gift wrapping service is only available for items purchased from Paper Concierge.